Hey! Looking for a little input. We have a small (2900 sq ft) venue for weddings, rehearsal dinners, etc. We also throw an occasional Loft Party. Our current dance floor setup is a pair of La Scalas, a Pair of Cornwalls, and a Pair of JBL Theater Subs. McIntosh MC30's with a Mc 4100 Receiver as preamp. There are also a pari of Chorus across the room facing the rest of the setup. All in all, sounds pretty fantastic. UNTIL, you had a 100 guests or so... Then the highs and mids suffer considerably. I have just picked up a second set of matching La Scalas that will be stacked on top of the first set. Not sure this will be enough, so I'd like any thoughts you may have on adding some wall mounted speakers up high. I do have KP 250s available, as well as JBL 4312. We do play this all LOUD on dance nights. I want to make sure the smaller, higher speakers can keep up. I would make bases/stands to get the LaScalas up high enough to get the mid horns and tweeters higher than the heads of your guests. You could raise the Corns as well. Obviously, the subs could stay on the floor. 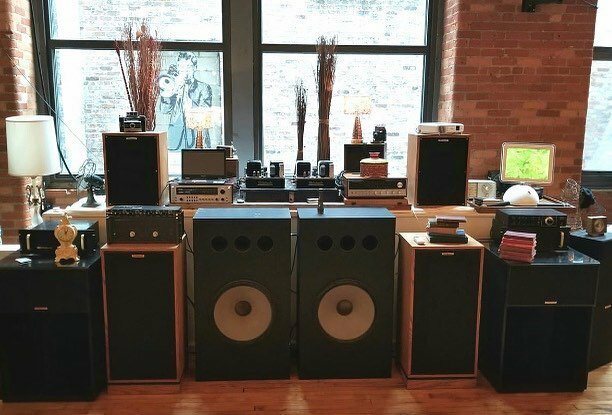 I would try that first befor buying more/different speakers. True unless they are getting drunk and these are subject to being knocked over. Based on what I have seen in my shops poor acoustic environment I think the better Pro gear has much better ability to overwhelm a bad environment. Based﻿ on what I have seen in my shops poor acoustic environment I think the better﻿ Pro gear has much better ability to overwhelm a bad environment. Absolutely. I surely wouldn't use my Cornwalls and LA scalas in a loud party type atmosphere. Asking for issues IMO. I don't know what kind of guests they might have but I traveled for a few years building night clubs. The nonsense we went through to make things drunk proof would defy belief. The﻿ nonsense we went through to make things drunk proof would defy belief. La Scalas have been used in clubs for years. Yes, the other pro gear would work better/easier, but they now have two pair of LS. While it could get rowdy, to me it sounds like a more controlled environment. MY HEARING’S NOT SO GREAT SINCE I USED FOUR SPEAKERLAB SKHORNS TO DEAFEN ADOLESCENTS ACROSS DETROIT. I have played my la scalas, currently being taken care if by my friend Marcel, in clubs party’s and rehearsals with about 100 people there.....and no problems. I wonder if there are too many speakers set up wrong and fighting each other. My mobile DJ biz was a perfect way to pay my law school tuition in 1975. I ran it more like a dance club. There was a microphone but I rarely said anything. When the mic was used, it was the young people making dedications, announcements, etc. I did not talk between songs. The music was the entertainment, not yours truly. The mixer preamp was made by Meteor (perhaps a local maker). There were two phono inputs and at least one auxiliary input. It had slide volume controls for each source, allowing me to cut the volume from one turntable while simultaneously increasing the volume to the other turntable. The Stanton 681 EEE cartridges allowed back cuing to get the next turntable in position. There was no “scratching,” if that was even a thing in 1975. Sennheiser HD 424 headphones were used to cue up the next offering. A Sony TC 161-SD cassette deck was rarely used to keep the music going while I visited a man about a horse. The system allowed me to tailor the music to the crowd and its mood. Originally, I assumed college groups would be my target market, as I was closer in age to them and felt I could understand their musical tastes better. While I did a lot of gigs at fraternities, sorities, dorms, etc. in Ann Arbor, East Lansing, and Kalamazoo, I soon learned that pleasing high school and junior high audiences was easy and fun. The gigs were closer to home and done by 11:00 PM, if not sooner. That beat the heck out of driving home from East Lansing at 2:00 AM. Those four plywood Speakerlab SKhorns worked well whether filling the small dining room at a fraternity house or a large high school gymnasium. The backs were enclosed by plywood. Naturally, they worked best in proper corners, but they did OK when that wasn’t possible. Speakerlab offered versions in 8 ohm or 4 ohm. Mine were 8 ohm allowing two in parallel for each channel placing a 4 ohm load on the Dynaco ST-400 amp. In gyms, the runs were very long. I used 12 gauge Zip cord in various lengths with guitar plugs to connect sections. The speakers were placed with the “left” channel and “right” channel speakers diagonally opposed to each other. In other words, starting in a corner and moving clockwise around the four corners, it would be left, right, left, right. With a 4 ohm load, the Dynaco was rated at 300 watts/channel. The efficient SKhorns could fill a gymnasium or cafeteria with loud and clear music. People danced. Jr. high and high school chaperones liked the fact that there were no breaks, so the kids weren’t wandering off and causing trouble. While I did many repeat gigs, my best repeat customer was a jr. high. The kids would vote whether to have a band or me, they repeatedly voted for me. Live bands are great, but for what I was charging, you could not hire a very good band. Rather than a garage band trying to play the popular songs, they preferred to dance to Bob Seger, Fleetwod Mac, etc., at live concert levels. One evening after a dance at my best customer, I discovered that one of the Atlas squawker drivers had disappeared. 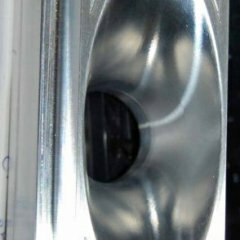 The Speakerlab 350 aluminum horn was threaded just like a K400. The school was extremely apologetic and assured me it would pay for a replacement. On Monday, the principal announced over the PA that there would be no more dances until the driver was returned. It appeared in his office almost immediately, so it wasn’t necessary to order a replacement from Speakerlab. That incident prompted me to enclose the backs of the top hats in hardware cloth (wire screen) as well as covering the fronts to keep stuff from being shoved into the horns. The need to move the ~180# speakers into place using a hand-truck eliminated any concern about a whole speaker disappearing. As has been suggested, raising the speakers up was desirable. Many school cafeterias also serve as gyms and auditoriums. In such situations, placing two of the speakers up on the stage sprayed the sound over the heads of the dancers. Nevertheless, having all four on the floor worked well also. The bass was palpable under most circumstances. The song Love Will Find A Way by Pablo Cruise had an especially prominent bass line that sounded great from the SKhorns. So good in fact, one sorority called to book a repeat gig and wanted to know if the quoted price included the drummer. It was all I could do to convince the young woman that there had not been a drummer at the prior gig. Painted black with the backs closed and covered with hardware cloth, these were Speakerlab “Pro.” My original plan was to use a pair of Klipschorn decorators, but the opportunity to get 4 factory built plywood SKhorns from Speakerlab for approximately the same price was irresistible. Of course real Klipschorns were better, but the SKhorns took a beating and did the job. What issues? I thought la scales were intended for pa use. Blown drivers, damaged cabinets, drunken accidents. Generally, we have respectful, well behaved guests. We target a more mature market. But, it only takes one. Anything we stack or have raised will be well supported. You never know what you are going to find stuffed in speakers. I had some KP260's once with holes in the back and people thought that was a great place for peppermint candy and ABC gum. That could be a factor at times, but we can turn them off individually. It sounds fantastic when the room isn't full of people. I think the mids and highs are just getting lost in the bodies. I am still wondering about how many speakers you are using for one venue at a time. I was told if I wanted to put sound in a restaurant for instance with four speakers, one in each corner, to flips the channels so that the right side faced the left and the left would face the right. There is an art to making things sound right in tandem. Just read what you said about crowd size again. Maybe bi-amping and a mixer board is the answer to a changing environment. I don't know just guessing. Chief Bonehead endorses the La Scala for this and I know they get loud enough. Absolutely need to get the tweeters and squawkers up over the guests and angle them down slightly.